The new high performance precision gimbal stabilization system ZYX-GS from Tarot provides dedicated independent gimbal control to efficiently and effectively stabilize your AP/AV shots and ideally matched to our new PTZ gimbal and other 3rd party gimbal providers. The ZYX-GS features 3-axis stabilization, adjustable gains (PC), attitude locking and attitude following modes, 3-axis MEMS gyro and accelerometer, free firmware upgrade services. Offering a wide range of servo support and an unbeatable price point, Tarot hopes to continue its trend of supplying quality products to the Heli and Multi-rotor markets at the lowest possible price. ZYX-GS provides two kinds of stabilization control mode, which are attitude locking mode and following (FPV) mode. These make the users aerial filming applications more flexible and convenient. ZYX-GS has different control algorithms for position servos and velocity servos (no potentiometer), this advantage allows people to choose suitable control mode according to their servo type. The gimbal stabilization system ZYX-GS uses high specification 3-axis MEMS gyro sensor and 3-axis MEMS accelerometer sensor. The advanced attitude algorithm�s updating rate is up to 800Hz, which can sense gimbal's attitude quickly and accurately. The control algorithm is optimized for aerial filming application, adapted to harsh climate, and provides steady performance for gimbals. ZYX-GS is composed of sensor module and control module, which simplifies users wiring. 1.Three axis stabilization. pan, tilt and roll stabilization. 2.Adjustable Gains and 3D attitude display on PC software. 3.Two control mode: attitude locking mode and attitude following mode(FPV). 4.Support stick rate mode and position mode. 5.Sensor technology: 3-Axis MEMS gyro and accelerometer. 6. 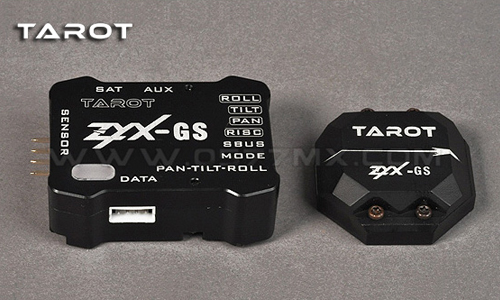 Supported gimbal: servo gimbal/Tarot motor-drive gimbal(in future). 7.Supported servo type: 1520/960/760 analog servo and 1520/960/760 digital servo. 8.Supported Receiver type: conventional/S-BUS/DSM2/DSMJ/DSMX receiver. 15.Max angular rate: 2000 º /sec. 18.Control range: -45º~45º (roll), -180 º ~180 º (pan), -135 º~90 ºtilt).